Who Were The Stickyback Photographers in England ? By around 1902 the name "Stickyback" had started to become known, and was associated with a particular type of tiny inexpensive portrait. The three unique selling points of these photographs were: tiny size, gummed back and probably most important - very low price - at times you could get a dozen StickyBacks for 3d, more normally for 6d. The clientele attracted to the StickyBacks establishment would have been very different to those attracted to a top photographic studio; hence some of the the advertisements listed below for "doorkeepers" at StickyBacks establishments. The price was such that some in this hitherto untapped clientele would have been tempted to return and provide the photographer with repeat business. A newspaper report on a travelling sticky back photographer in Cookstown commented, no doubt with some exaggeration, that "the inordinate vanity of some of the local shop assistants has led them to get upwards of twenty dozen of photos taken"
Multi-position camera backs allowed photographers to take multiple images on a single plate and photographers devised different ways to print strips of prints from single negatives. Over time specific apparatus became available for the production of stickyback photographs. Some photographers taking up this style of photography incorporated the word "Stickyback" or some variation into their business names. For others, this could have been simply an addition to a range of services already offered. What follows draws heavily on the extensive research undertaken by David Simkin and included on his invaluable site http://photohistory-sussex.co.uk. David Simkin lists here http://www.photohistory-sussex.co.uk/BoultwoodStickyBacksStudio.htm a number of StickyBack photographers he has discovered. It is hoped that the following will contribute towards a comprehensive listing of UK Sticky back studios which may prove to be of value to family and local historians. In the information below we have tried to identify stickyback photographers across the UK, mainly from information gleaned from local newspapers. But many of these photographers would not have used newspapers to advertise, preferring instead to advertise extensively at their premises. Others will not have advertised and may only become known today through surviving examples of their work. Survivals of sticky back photos are not that common due mainly to their small size and confusion with later photo booth images. This site is a work in progress and much more awaits discovery - please contact us if you have, or come across, any additional information on "Stickybacks" which you are willing to share via this site. If you come across Stickyback photos with only part of the photographer's address shown, searching these pages might match the partial address with the photographer's town. We have pages on this site for Sticky Back photographers in England, Scotland, Wales, Ireland, the Isle of Man and the rest of the world. References: Bath Chronicle and Weekly Gazette - Saturday 21 November 1914 p1. "Post all sticky backs lately taken to be enlarged for Xmas cards . Permanent process Willway, enlargement specialist, Beechen Cliff, Bath. One cabinet 2s"
PO Directory of Bath 1911, Kelly's Somerset Directory 1919, 1923. Full details of Theophilus Charles Willway can be found in "Secure the Shadow, Somerset Photographers 1839-1939" by Robin Ansell, Allan Collier and Phil Nichols. References: Stickybacks Studio, 23 Westgate Street, Bath, 1914-15. One of Sidney Boultwood's Sticky Back Studios, listed on David Simkin's excellent site on Sussex Photographers at www.photohistory-sussex.co.uk/BoultwoodStickyBacksStudio.htm where you will find the full history of Sidney Boultwood (1882-1958) and his family. 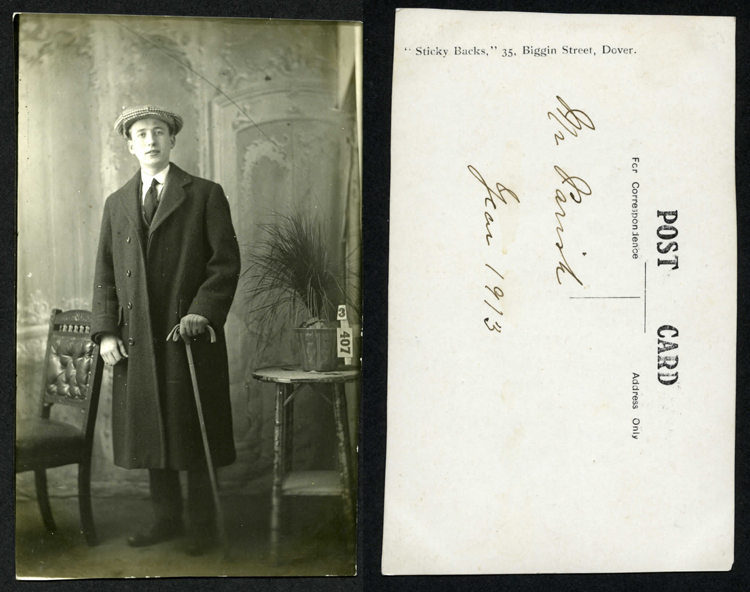 David Simkin has an example of a stickyback photo from this studio on his site at www.photohistory-sussex.co.uk/BoultwoodBrydenWestgateBath.jpg. Bath Chronicle and Weekly Gazette - Saturday 11 April 1914 p2, contained this advertisement: "Grand Opening To-Day. You must visit the Original Mr Stickybacks Electric Studios (from Strand, London, and Provinces) 23 Westgate Street (near Theatre and Palace) Bath. Just a snapshot of yourself for 6d doz. They've all got Stickybacks. Enormously popular." In the same newspaper, page 9, it was reported: "New Electric Studio. As will be seen from an advertisement in our public notices column Mr "Stickyback" has today opened an electric studio for midget photography. These studios have been very popular in other towns, and no doubt the business opened today will prove an attraction in this busy thoroughfare." Obviously the studio did prove to be popular as the firm was advertising for "bouncers" in the Bath Chronicle and Weekly Gazette Sat 8 Aug 1914 p1. "Doormen, two wanted; men used to theatre preferred; only smart young men with good references entertained; permanencies to right men - Full particulars to Studios, 23 Westgate Street Bath or 84 High Street Cheltenham." References: Liverpool Echo - Wednesday 09 December 1914 p6, "Man, middle aged, understanding bromide printing and developing 25/- and commission. Call Friday, Sticky Backs, 39 Grange Road West, Birkenhead." According to the 1914 Kelly's directory of Cheshire, 39 Grange Road West was occupied by photographer Stella Grossi, the younger sister of Spiridione Grossi. 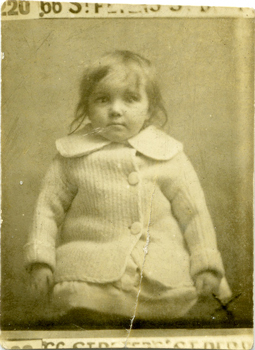 In 1911 Stella was at 77 Paradise Street Liverpool. The 1913 local directory listed Stella as a photographer at 57 Bold Street Liverpool. Later she married William Henry Huish and set up a studio in Morecambe. We have more here on our site on Stella Grossi. Possible practitioner: "MR STICKYBACK" - believed to be HARRY LLOYD. References: The Era - Wednesday 08 December 1915 p25. "Wanted, photographic Operator, used to Sticky Back business, must be capable of taking sole control of a shop and understanding the trade from beginning to end. References required. State terms by letter only to F.Williams, 206 Maryvale Road, Bourneville, Birmingham"
Address: 64 Waterloo Rd, South Shore, Blackpool. Possible practitioner: WORLD'S PHOTO CO, names of proprietors not currently known. References: The Era - Saturday 04 August 1906 p27."Wanted. Quick operator and finisher for StickyBack photos. No learners need apply. Reference and full particulars to the manager, Worlds' Photo Co, 64 Waterloo Rd, South Shore, Blackpool." Address: 28 Newport Street, Bolton. References: Bolton Evening News - Friday 08 January 1904 P3. "Sticky Backs, Pleasall Photo Co, 28 Newport Street, Bolton." References: The Era - Saturday 17 December 1904 P27. "Wanted Sticky Backs on sharing terms in good positions Bradford and Manchester. Applicants must be able to provide everything except room and gas. Room for other novs (sic) on same terms. Pike, 83 Stratford Road Manchester." References: The 1911 Kelly’s Directory for Sussex, shows Spiridione Grossi, photographer, 54 North Street, Brighton. David Simkin, in his excellent site on Sussex photographers, states that Grossi's studio at 54 North Street went under the name of "The Sticky Back & Post Card Studio". By around 1912 the Brighton studio had been taken over by another photographer, Abraham Dudkin. www.photohistory-sussex.co.uk/BoultwoodFamilyGallery.htm and www.photohistory-sussex.co.uk/DudkinModernStudios.htm. and the studio was known as the "Sticky Back and Modern Studio". From 1915 to 1919 Abraham Dudkin's firm traded as "Modern Studios". It is not currently known whether this change of name indicated that they no longer produced stickyback photos. 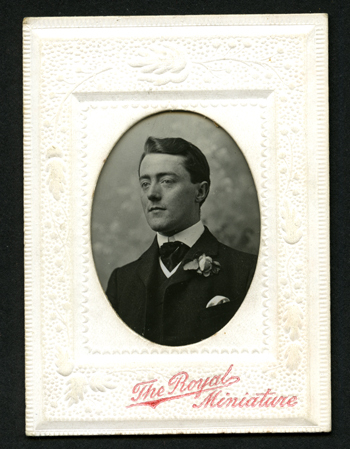 There are a number of surviving postcard format portraits from Modern Studios. After 1917 Abraham moved from 54 North Street to 10 Queen's Road Brighton where he operated until 1922. 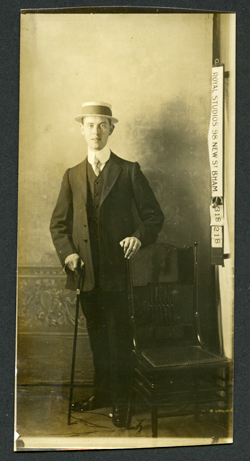 Abraham Dudkin's brother, Mordecai Dudkin, was a partner in the business. Mordecai operated from 157a Church Road, Hove 1915-17 and from 26 West Street, Brighton 1916-24. The firm also had a studio at 19 High Street, Shoreham 1918-19. Address: Brighton - precise address not known, but could be another reference to 54 North Street Brighton as in the entry above. See also below an example postcard from the studio of "Stickybacks 19 North Street Brighton"
Possible practitioner: Could this be GROSSI,SPIRIDIONE or BOULTWOOD, SIDNEY. References: Croydon Chronicle and East Surrey Advertiser - Saturday 18 March 1911 p12 and 25 March 1911 p13. "Sticky Backs from 356 Strand, and Brighton, have now opened a Croydon Branch, 127 North End (opposite Empire) and have no connection with any other firm in Croydon". This could be Spiridione Grossi, who, when prosecuted for abduction in March 1913 stated that he had “business interests in Liverpool, London, Manchester, Brighton and Brussels”. On the other hand, David Simkin's research into Sidney Boultwood shows that he had connections with Croydon around 1911 and later had a studio, as yet not identified, which was "Opposite Empire". However, David dates the "Opposite Empire" studio at around 1917 www.photohistory-sussex.co.uk/BoultwoodFamilyGallery.htm . Address: Brighton - precise address not known. but could be another reference to 54 North Street Brighton as in the entry above. See also below an example postcard from the studio of "Stickybacks 19 North Street Brighton". References: Gloucestershire Echo - Monday 01 June 1914 P4. "YOU MUST VISIT the original Mr Stickybacks ELECTRIC STUDIO With its novel methods of CINEMATOGRAPH PHOTOGRAPHY. CINEMATOGRAPHIC SNAPSHOTS OF YOURSELF. ENORMOUSLY POPULAR. The Original Mr. STICKY BACK'S STUDIO From 420 Strand, London, Brighton, Oxford, etc., 84 HIGH STREET (near Bath Road) CHELTENHAM." Over the years many photographers have operated in the Strand. 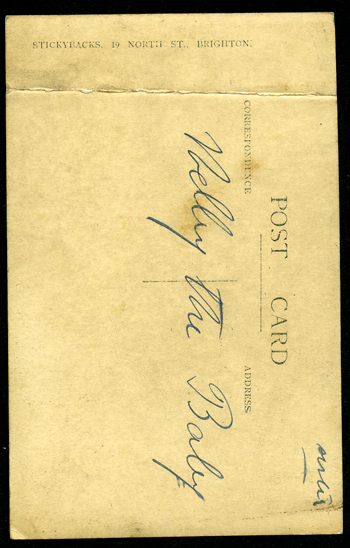 The address at 420 The Strand appears on the real photograph postcard portrait below (author’s collection). The studio there was called “The Post Card Studio”. The studio name and job number are printed along the right hand margin of the photograph, suggesting that the photographer / inventor may have been experimenting with ways of including identifying text within the printed image area, as in the smaller stickyback photographs. We know that Spiridione Grossi had a studio in Brighton and that he had used the name "The Post Card Studio" elsewhere, making it likely that this Cheltenham advertisement was for his businesses. On the other hand, David Simkin's research into Sidney Boultwood shows that he had a studio at 23 Westgate Street Bath www.photohistory-sussex.co.uk/BoultwoodFamilyGallery.htm . The Bath Chronicle and Weekly Gazette, Sat 8 Aug 1914 p1, carries an advertisement: " Doormen, two wanted; men used to theatre preferred; only smart young men with good references entertained; permanencies to right men - Full particulars to Studios, 23 Westgate Street Bath or 84 High Street Cheltenham". Linking the Bath and Cheltenham studios in this way shows that these were Sidney Boultwood's studios. The wording of the Cheltenham advert suggests that Sidney did, at some stage, have a studio in Brighton. Address: New England Road, Brighton ? References: Photo historian Paul Clarke has posted on Flickr.com some 25 small portraits from an Edwardian photo album. There are three definite stickyback photos among these. These include two examples from 54 North Street Brighton and another from "New England Rd". There was a New England Rd in Brighton and so attributing this to another studio in the same town is a reasonable working hypothesis. The image can be seen at: https://www.flickr.com/photos/runninginsuffolk/30425808583/in/album-72157675381993741/ . The style of lettering does not seem to match that used by either Sidney Boultwood or Spiridione Grossi - the font face is too light. Also the way that "RD" is depicted is different. Both Boultwood and Grossi used a full height capital letter for the "R" and half height for the capital letter "D" with a full stop underneath it. whereas the New England Rd example uses full height capital "R" and a slightly reduced height capital "D". 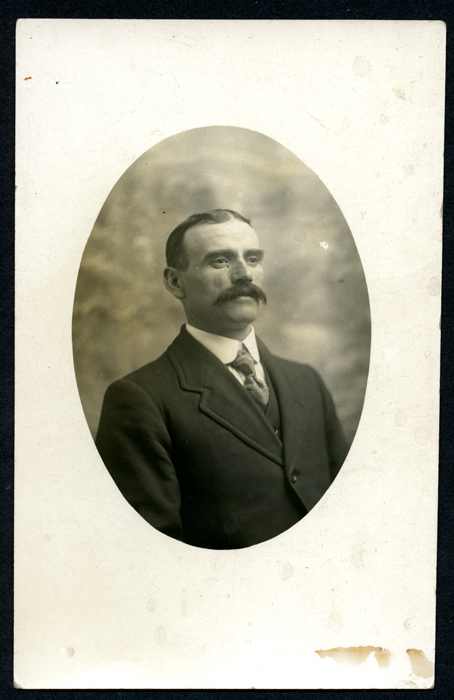 Below is a postcard cameo portrait of an unknown man with moustache. This is from Sticky Back and Modern Studios 54 North Street Brighton. This appears to be a finished and well composed product, as does the following postcard from the same studio with a group of three sitters. Next is a nicely composed portrait of a young girl, taken at another Brighton StickyBacks Studio at 19 North Street, Brighton. References: Western Daily Press - Tuesday 22 December 1903 P7. "They've all got sticky backs at the Polytechnic Studio St Augustine's Parade" (Bristol). Possible practitioner: WILLETT, HENRY R.
Theft of "Sticky-Backs" promotional discount tickets value one shilling from H.O.Seaman's photographers, 27 Castle Street, Bristol - offender sentenced by court to 5 years detention. See our page on Seaman photographer's. References:Western Daily Press - Wednesday 25 April 1923 p2. "Ladies required, experienced in photography, apply Sticky Backs 19 Castle Street". Possible practitioner: KNIGHT, CHARLES HENRY, aka "The Original Stickybacks"
References: Dover Express - Friday 05 November 1920 P5. "DOVER PHOTOGRAPHER'S BANKRUPTCY. At the Kent Bankruptcy Court Saturday the following Re Charles Henry Knight, of. 35, Biggin St., and Snargate St. Dover, and 21 Tontine St. Folkestone and 69 Wellington St, Woolwich, debtor, who attended for his public examination, returned his liabilities at £528.8.10d. and estimated his assets at £74 17s. 10d., leaving a deficiency £454. 11s. Mr De Wet, of Folkestone, appeared for the debtor. Under examination by the Official Receiver, debtor stated that he was formerly engaged as a salesman and in June 1913, he commenced business as a miniature photographer at 35, Biggin Street, Dover, in partnership with Mr. Herbert Beach, under name of the Original Stickybacks. They commenced with a capital £50, of which £30 was borrowed. The business was not a success and in December 1913, it was agreed that they should dissolve the partnership. Beach withdrew from the concern, without any consideration whatever, and debtor took over the concern with its assets and liabilities. The assets were estimated at about £40 and the liabilities about £15. Owing to the influx of troops he commenced to do remarkably well and continued to do so for several years. extended his business by opening branch businesses at Snargate St., Dover, 69, Wellington St., Woolwich, Lower- Bridge St. Canterbury (the Canterbury business did not pay and it closed after six months), and 21, Tontine St., Folkestone. With the exception of the Canterbury shop the concerns were successful. He did very well and was able to finance them easily and without any outside assistance. Soon after the Armistice, however, his receipts fell off by fifty per cent. That was owing to the removal of the troops. He sold the Woolwich business in May this year, and prior to the receiving order he had also disposed of the branch businesses at Snargate St., Dover, and at Folkestone. He then entirely devoted himself to the business at 35, Biggin St., Dover. In February, 1916, he, in conjunction with two other persons, opened a canteen in Sandwich, but this venture was a failure, as was also a miniature rifle range, which he and another person conducted at Sandwich. He estimated that his losses on these two enterprises amounted to at least £300. The cause of his failure were: falling off in trade since the Armistice, November, 1918, losses incurred in canteen enterprise, and law costs consequent on proceedings instituted by creditors for recovery of debts. The examination was closed." Dover Express - Friday 24 September 1920 P4 – receiving order made against Charles Henry Knight. References: Gloucestershire Echo - Monday 01 June 1914 P4. "YOU MUST VISIT the original Mr Stickybacks ELECTRIC STUDIO With its novel methods of CINEMATOGRAPH PHOTOGRAPHY. CINEMATOGRAPHIC SNAPSHOTS OF YOURSELF. ENORMOUSLY POPULAR The Original Mr. STICKY BACK'S STUDIO From 420 Strand, London, Brighton, Oxford, etc., 84 HIGH STREET (near Bath Road) CHELTENHAM.". Gloucestershire Echo - Wednesday 03 June 1914 p5. "The Original Sticky Back Studio. High-street, seems to have become remarkably popular, judging by the crowds visiting the Studio lately. One is bound to admit that these little photographs are remarkably good, surprisingly so in fact, are extraordinarily good value. They are produced by the latest Cinematographic process, which accounts for tho marvellous rapidity with which they are taken. They are, as claimed, "just a snapshot of yourself", and they've all got stickybacks. Mr. Stickybacks Studio is at 84 High-street (near Bath road), Cheltenham". Gloucestershire Echo - Thursday 18 June 1914 p2. Active reliable man wanted for circular distribution, door to door, Stickyback, 84 High Street, Cheltenham. Bath Chronicle and Weekly Gazette Sat 8 Aug 1914 p1. " 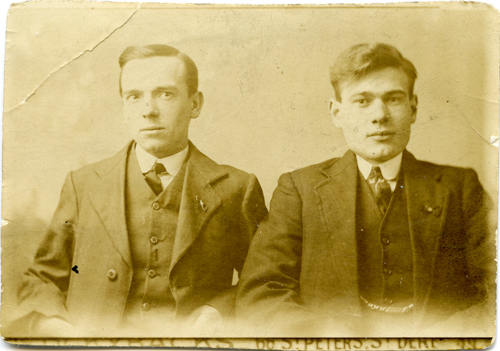 Doormen, two wanted; men used to theatre preferred; only smart young men with good references entertained; permanencies to right men - Full particulars to Studios, 23 Westgate Street Bath or 84 High Street Cheltenham". The studio at 23 Westgate Street Bath was one of Sidney Boultwood's studios, so the Cheltenham address must have been another of his premises. The studio at 84 High Street may have only occupied part of the address as a number of advertisements appeared in the press before and after June 1914 for J.Maxwell, fish merchant at 84 High St.
References: Liverpool Echo - Thursday 08 August 1918 p1. "Photography lady or youth thorough knowledge bromide printing and developing £2 weekly. Full particulars Tofiss Grossi Stickybacks 14 Foregate Chester." The unusual surname suggests that Tofiss was related to Spiridione Grossi. To date however no further information has been found about him. References: Derby Daily Telegraph - Tuesday 19 September 1905 P1. "Partner wanted for that lucrative branch of photography known as "sticky backs" methods entirely new advertiser's profits last 18 months £40 - £60 weekly; capital about £70 address Winfield 2 Litchurch Street Derby." The Era - Saturday 23 September 1905 p27. Same ad as above, but address shown as "Hardy 2 Litchurch St Derby." References: Derby Daily Telegraph - Friday 06 November 1914 p1." Young man wanted to generally assist in dark room and studios; knowledge of photography not essential. Permanency to smart fellow. 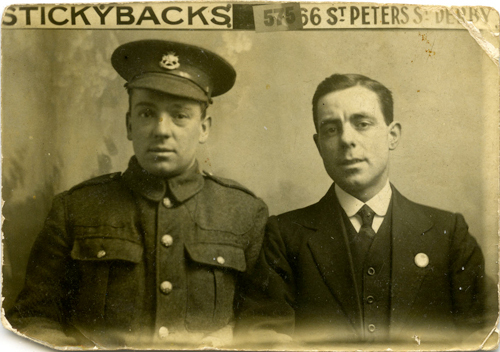 Mr Stickyback's Studios 66 St Peter's street." Nottingham Evening Post - Thursday 21 August 1919 p4. "Young lady assistant required about 20 for Ilkeston branch. Wages &c Stickybacks Ltd 66 St Peters Street Derby." Stickybacks Studio, 66 St Peter's Street, Derby, 1915-16. One of Sidney Boultwood's Sticky Back Studios, listed by David Simkin on his excellent site on Sussex Photographers at www.photohistory-sussex.co.uk/BoultwoodStickyBacksStudio.htm where you will find the full history of Sidney Boultwood (1882-1958) and his family. 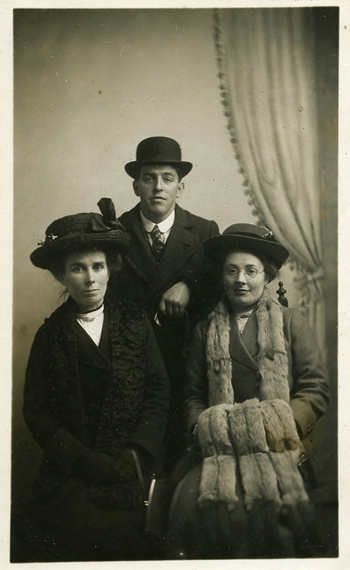 The three portraits below, of unknown sitters c.1915-16, are from the personal collection of photo historian, writer and researcher Brett Payne. One of these was used in a post on Brett's Photo-Sleuth blog in 2013 at: http://photo-sleuth.blogspot.com/2013/05/sepia-saturday-175-andy-warhol-looks.html . Brett runs an excellent website on Derbyshire Photographers: http://freepages.rootsweb.com/~brett/genealogy/photos/dbyphotos.html and we are most grateful to him for permission to show these portraits here. References: Derby Daily Telegraph - Monday 30 January 1922 p2. Advertisement for an auction at Derby included in the list of lots: "Also professional photographers equipment, including stickyback camera, complete with lens and all accessories, (by Billclef), patent printing machine, patent adjustable seat, developing dishes and tanks etc". The "Billclef" mentioned in this advertisement would have been Joshuah Billcliff, a camera manufacturer from Manchester, who patented a revolving camera back in 1885, patent no 13956. Joshuah died in 1898 and his firm, The Billcliff Camera Works, was continued by his sons. There is an example here on the Early Photography site of a Billcliffe camera from around 1906 with a multiposition back, used to produce multiple small photos on a single half plate film. Possible practitioner: KNIGHT, CHARLES HENRY, aka "Original Stickybacks" and "The Photographers"
References: Dover Express - Friday 18 September 1914 p1. " Youth wanted to make himself generally useful. Apply between 4 and 5 Sticky Backs, Biggin Street". Dover Express - Friday 05 November 1920 P5. "DOVER PHOTOGRAPHER'S BANKRUPTCY. At the Kent Bankruptcy Court Saturday the following Re Charles Henry Knight, of. 35, Biggin St., and Snargate St. Dover, and 21 Tontine St. Folkestone and 69 Wellington St, Woolwich, debtor, who attended for his public examination, returned his liabilities at £528.8.10d. and estimated his assets at £74 17s. 10d., leaving a deficiency £454. 11s. Mr De Wet, of Folkestone, appeared for the debtor. Under examination by the Official Receiver, debtor stated that he was formerly engaged as a salesman and in June 1913, he commenced business as a miniature photographer at 35, Biggin Street, Dover, in partnership with Mr. Herbert Beach, under name of the Original Stickybacks. They commenced with a capital £50, of which £30 was borrowed. The business was not a success and in December 1913, it was agreed that they should dissolve the partnership. Beach withdrew from the concern, without any consideration whatever, and debtor took over the concern with its assets and liabilities. The assets were estimated at about £40 and the liabilities about £15. Owing to the influx of troops he commenced to do remarkably well and continued to do so for several years. extended his business by opening branch businesses at Snargate St., Dover, 69, Wellington St., Woolwich, Lower- Bridge St. Canterbury (the Canterbury business did not pay and it closed after six months), and 21, Tontine St., Folkestone. With the exception of the Canterbury shop the concerns were successful. He did very well and was able to finance them easily and without any outside assistance. Soon after the Armistice, however, his receipts fell off by fifty per cent. That was owing to the removal of the troops. He sold the Woolwich business in May this year, and prior to the receiving order he had also disposed of the branch businesses at Snargate St., Dover, and at Folkestone. He then entirely devoted himself to the business at 35, Biggin St., Dover. In February, 1916, he, in conjunction with two other persons, opened a canteen in Sandwich, but this venture was a failure, as was also a miniature rifle range, which he and another person conducted at Sandwich. He estimated that his losses on these two enterprises amounted to at least £300. The cause of his failure were: falling off in trade since the Armistice, November, 1918, losses incurred in canteen enterprise, and law costs consequent on proceedings instituted by creditors for recovery of debts. The examination was closed." Dover Express - Friday 24 September 1920 P4 – receiving order made against Charles Henry Knight. The London Gazette, 13 March 1923, Issue 32805, Page 2002 - Original Mr Stickybacks Electric Studios Ltd to be removed from register in 3 months. The London Gazette, 6 July 1923 Issue:32842 Page:4724, Original Mr.Stickyback's Electric Studios Limited removed from register. An excellent humorous example photograph from the 35 Biggin Street studio has been posted on Flickr.com, by its owner Paul Wells. 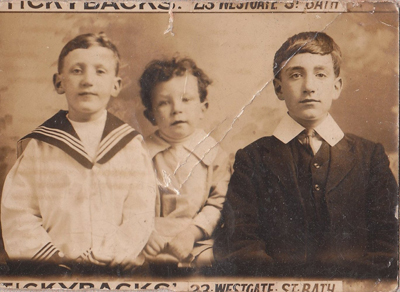 He has entitled the image "dodgey geezers" and it can be seen at https://www.flickr.com/photos/doverpast/6391080845 . 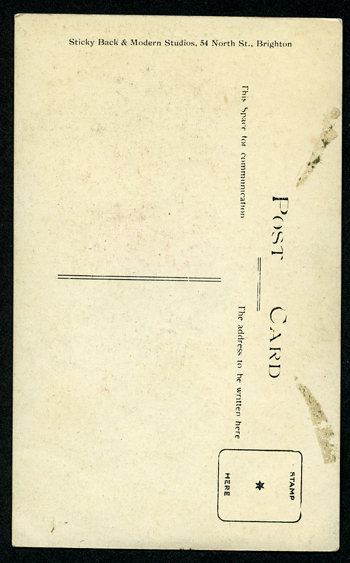 Below is a small postcard 134 x 84mm from "Sticky Backs" 35 Biggin Street, Dover, on reverse in manuscript, "Mr Parish 1913". Note the negative number shown on the right hand side of the image, leaving the subject off-centre. 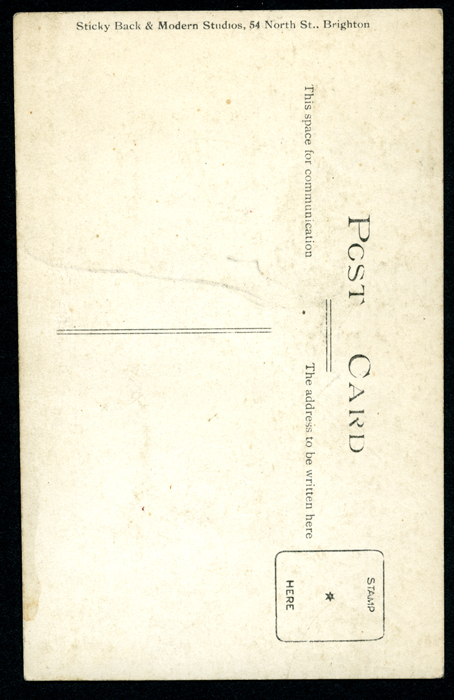 The card is not exactly square - would this have been one from a conjoined set of postcards, cut up by the sitter? 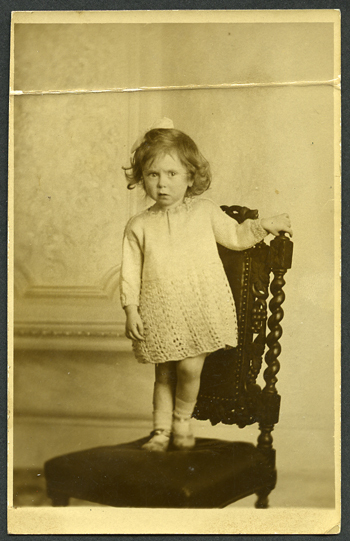 References: the small portrait below is about 2 in x 1.5 and in in an ornate embossed card mount 3 in x 2.25 in. 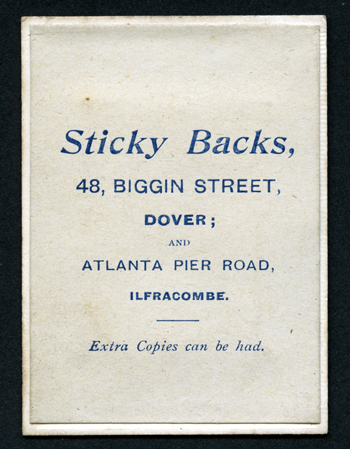 The mount is labeled "The Royal Miniature" and on the reverse is "Sticky Backs, 48 Biggin Street Dover and Atlanta Pier Road Ilfracombe". The mount is similar to that used for tiny tin types. References: Durham County Advertiser - Friday 13 February 1903 p5. Report of Trades' Exhibition in the Drill Hall, Gilesgate, Durham "Stickybacks appear to be in great demand". References: Cornishman - Thursday 25 November 1915 p1" NEXT WEEK ! FOR XMAS ! LOOK OUT FOR THE "WEST END" "STICKY BACKS" Opening at 84, Market Jew St., Penzance. Perfect Portraits at Popular Prices! Head and Shoulders - - 3s. Per Dozen. Three Quarter Figure - - 6d. 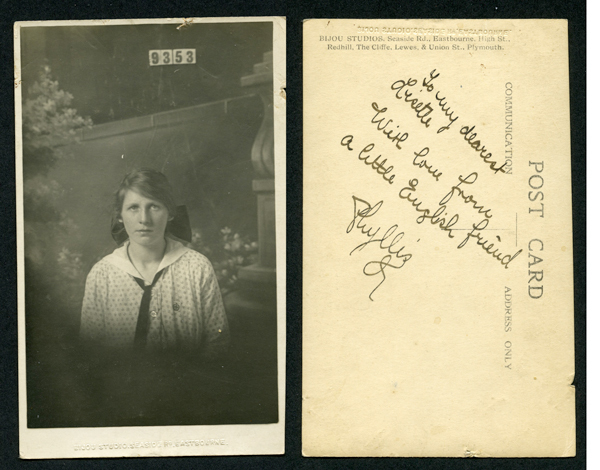 „ (The West End Panels) LIFELIKE, WELL FINISHED, PERMANENT PHOTOGRAPHS Also at High Street, FALMOUTH.". No trace of a photographer in High St Falmouth in 1910 or 1914 Kelly's Directories. References: Hartlepool Northern Daily Mail Saturday 22 December 1906 p2. "Hallo, Hallo, Hallo. Is my face red? The latest! Call at Doyle's 41 Northgate, Hartlepool, and have your Sticky Back for Christmas. The largest and most up to date stock for XMas and New Year cards. Also a large selection of picture postcards at prices to suit all classes. Call early and inspect for yourselves. Note address 41 Northgate, Hartlepool". References: In a discussion about a proposed Photographic Assistants Union, Robert C.Platt Jnr, 51 Carr Street, Hebburn-on-Tyne wrote: "We should not exclude from such a Union the man who starts in a small way on his own account. Personally I am in business on my own account, and I may say I am not turning out 24in x 20in carbons and driving about in my motor-car, but am producing the class of photographs which sell, and by which I have managed to make a living and pay my way for the past few years. I don’t go in for “stickybacks and postcards” for any particular love for that class of business, but simply because I find it easier to keep myself in constant employment and therefore be more certain of a regular wage each week. It only needs a glance at your advertising columns to show what class of work is required from assistants and also I have met several really capable photographers in my time who were glad to turn to a cheaper class of work in order to make a living, not to mention men who run high class establishments in one part of the town and a stickyback shop in another. I am in no way blind to the advantages of a really high class business turning out the best of work and when I get hold of sufficient capital I hope to have a business like that myself. But in the meantime I can’t help noticing the number of photographers who are producing cheaper stuff. These men are not fools, nor yet are they necessarily incapable of doing good work, but they simply realise the necessity of making a living and realise that the most certain way of doing so is to supply goods at a price low enough to be within reach of the surrounding population". British Journal of Photography Sept 15 1911 p712. References: Heywood Advertiser Friday 11 May 1906 p1: "Wages are going up all over the town, but the price of Sticky-backs is coming down. 3d a dozen, you will agree, this offer is great. So you'd better hurry up before you're too late. Sticky-backs 3d per doz. Same quality as usual. Mawdsley, Photographer, Broadfield Studio". References: David Simkin has full details of the Dudkin family, their photographic business and their studios on his excellent site on Sussex Photographers: www.photohistory-sussex.co.uk/DudkinModernStudios.htm. References: Nottingham Evening Post - Thursday 21 August 1919 p4. "Young lady assistant required about 20 for Ilkeston branch. Wages &c Stickybacks Ltd 66 St Peters Street Derby." The Derby Studio at 66 St Peters St has been identified as one of Sidney Boultwood's Sticky Back Studios, listed on David Simkin's excellent site on Sussex Photographers at www.photohistory-sussex.co.uk/BoultwoodStickyBacksStudio.htm where you will find the full history of Sidney Boultwood (1882-1958) and his family. Nottingham Evening Post - Thursday 11 September 1919 p3. " Glass sign for sale. No frame, about 11 ft by 22in £3 cash. Stickyback Ilkeston". Robert Pols lists an Ipswich photographer MASON, J Winton of 21 St Peter's Street, Ipswich listed in local Directories 1906,1906/7 and 1908 www.early-photographers.org.uk/Suf%20K-M.html Also, Robert Polls excellent listing of photographers from Kings Lynn, Norfolk, http://subdomain.early-photographers.org.uk/?page_id=84 has an entry for The Gainsborough Studio, Kings Lynn, where he draws attention to a newspaper report from the Lincolnshire Echo 11 May 1907, p4: "COUNTY Court On Thursday, before His Honour Judge Mulligan, K.C., Charles Holman, of Norfolk-street, Lynn, tobacconist. sued George Mason and Foster, formerly trading as Gainsborough Photo Company, and now the Sticky Backs Company, Ipswich, for £5 damage done to premises which they hired in Norfolk Street, Lynn. It was alleged that the large number of gas burners which defendants used for taking photographs at night took all the virtue out of the ceiling, whilst chemicals were spilt about the floors and damaged them. It appeared that the tenancy expired on the 25th March, but defendants gave up the keys in January, and the repairs were executed by the middle of February. His Honour held that under these circumstances the plaintiff could not recover. After the landlord took possession the tenant could not re-enter, because in that case he would have been a trespasser. The landlord should have seen to the matter before he took possession, and given the tenant an opportunity to execute the repairs." References: Evening Star - Thursday 25 February 1909 p2. " For sale studio camera, sticky back photos in good condition; to be seen at 10 Northgate Street. No reasonable offer refused". Address: Bull Ring or Church Street Kidderminster (possibly same address as the two are contiguous).